JHS209-S80 shipborne electro-optic system is a searching and tracking system which integrate optical, mechanical and electrical together. As the weight is less than 10kgs and integrate gyro stabilization and target tracking function, it is mainly assembled on military ships for day and night surveillance. 1)Adopt network interface communication and wireless communication technology, which realize different operations from ground workstation on the equipment, and video image transmission as well. 2)Capable for video tracking, which enables manual/automatic locking and tracking. 3)High accuracy calibration to make sure the integration of visible light, infrared light and laser ranging. 4)Control the attitude of the photoelectric turret by the control handle. 5)Transmit data such as working mode, azimuth angle and pitch angle. 1) Multi-sensor IR + TV + LRF. 2) Small size, light weight, compact structure, strong adaptability carrier, low power consumption and high cost performance. 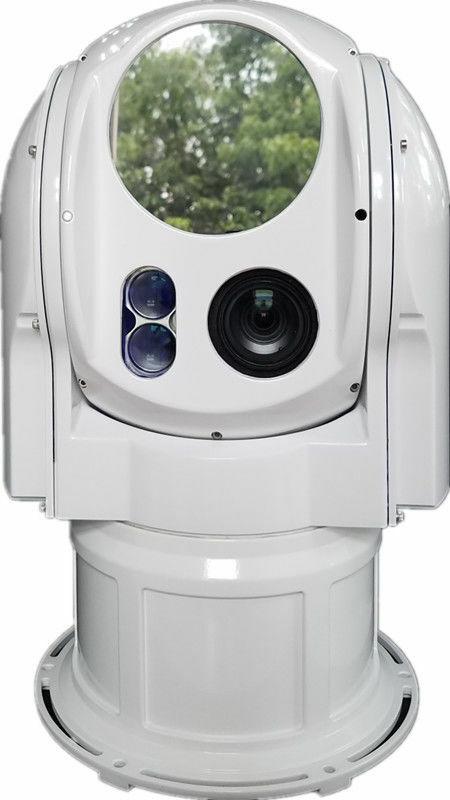 3) Equipped with horizontal and pitch axis stabilization, combined with high accuracy gyroscope and servo control system, it can realize detection without dead angle and support day and night observation. 4) Full-sealing, high level waterproof, optical mechanical and electrical integration design, strong capability of anti-vibration and anti-shock makes it capable of working under severe environment for a long time.